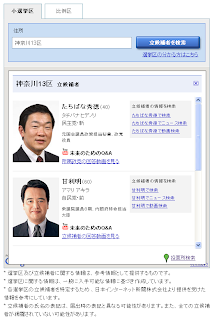 In preparation for Japan's recent election, the Google Japan team launched a 2009 election "choose the future" site with election information and candidate responses to "5 Questions" asked and selected by citizens via Google Moderator. 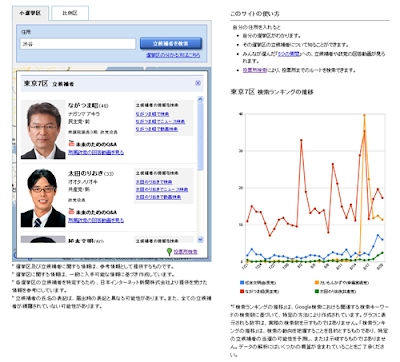 The site, which now displays election results and news, also included candidate search trends leading up to election day. 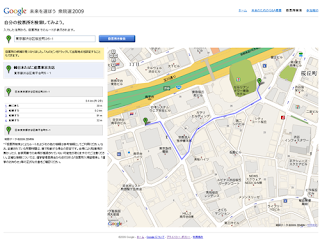 ＜東京都渋谷区桜丘町 26-1 の例＞ "Example 26-1 Sakuragaoka-cho Shibuya-ku in Tokyo"
＜東京都渋谷区渋谷の例＞ "Examples of Shibuya, Shibuya-ku, Tokyo"
Search by any street address. 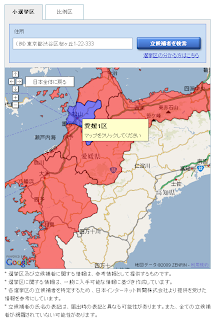 ＜東京 7 区の例＞ "Ku, Tokyo 7 cases of"
＜愛媛 1 区の例＞ "Ehime district example"
＜神奈川 13 区の例＞ "Kanagawa-ku, 13 cases of"